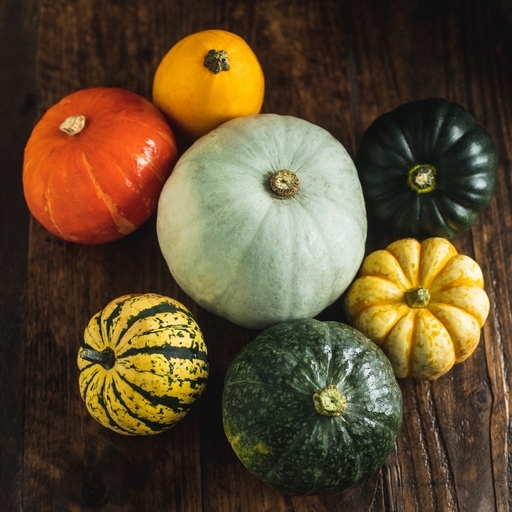 This organic squash box will bring a burst of autumnal colour to your kitchen. It’s a great-value way to try at least 3 different varieties, to fuel seasonal soups, stews, risottos and more. We’ll include a recipe card too, to help you identify and make the most of each variety. Try in our squash risotto recipe. We grow many different varieties and different varieties work better in different recipes. Butternut is great for risotto or soup and kabocha, Red Onion and Crown Prince are particularly good for roasting. The seeds and inside trimmings from squash can be added to homemade veg stock to add a vibrant colour. Delivered from our farm, so wash before cooking. They keep well at room temperature. We sow our squash in small pots in late April for planting out in mid May. They will not tolerate frost and we sometimes use crop covers to get them off to a good start. If the recipe you are using calls for chunks you’ll have to peel it. The skin is too hard for a peeler, so use a knife by placing the squash half face down on a board, working round with a knife, cutting the skin off. Make sure you never put a whole squash in the oven, it will explode. Cut it in half and de-seed first.